Welcome to Manor House Kohala! 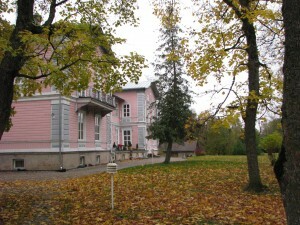 A Manor house in Lääne-Virumaa, on the banks of Kunda River, in a picturesque place, in the middle of an English-style park. We are happy to welcome you to picturesque Manor House of Kohala. We are located 120 km from Tallinn to direction of St. Petersburg. The motorway offers generally good driving conditions; it is fast and in section has two lanes in both directions. The trip from capital to Kohala is taking around 1,5 hour. It is very easy to find us: By car, the travelling time from Tallinn is 1.5 hours. Take the Tallinn – St. Petersburg motorway; in approx. 110 km you will arrive in the village named Sämi from where you will find signs to Uhtna (2 km). Turn left and follow these signs. Drive through the village of Uhtna and continue for about 3 km until you see the next sign for Kohala Manor. Turn off right and follow the driveway down the hill. When you see the pale pink manor house, you have found us. Manor House him self has been built already around the middle of 14′th century and mentioned first time in the historical documents in year 1489. At this time it was called Tolks and was in possession of the family von Wrangell. In the year 1996 OÜ Kreenika took over ownership of the building. Now a day here is a hotel with 13 rooms for 40 people, an advance reservation restaurant and in a separate house a sauna with a fireplace room. The environment of the manor is quiet and peaceful and offers a variety of possibilities for spending time – both in summer and in winter. Manor Kohala is a perfect choice for rest, recreation, but also for organization of training courses, negotiations and seminars. In manor barn lives Iceland horses. We can organize for You exciting horse ridings trips, for active rest we offer adventure games www.360.ee . You are welcome to see and enjoy!